The intention of the information provided in this web site is at present for educational and research purposes only. The biological and clinical significance of STIC and STIL is a work in progress and their impact to clinical management has still to be defined. The investigators involved in this study and all the web pages in ovariancancerprevention.org do not recommend the use of this pathological and immunostaining classification for clinical practice at the present time. 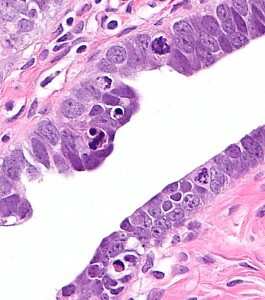 Ovarian high-grade serous carcinoma (HGSC) is the most lethal gynecologic malignancy and is characterized by frequent TP53 mutations and a high level of chromosomal instability, which is reflected by widespread DNA copy number changes compared to other types of epithelial ovarian carcinomas. 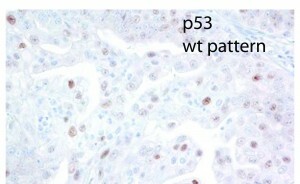 Unlike cancers arising in the colon, breast, cervix, endometrium, prostate, and pancreas, for which precursor lesions have been well recognized, serous tubal intraepithelial carcinomas (STICs) have only recently been identified as putative precursors of HGSC based on studies demonstrating identical TP53 mutations and similar high levels of chromosomal instability in both lesions. Additional evidence supporting this proposal is the observation that STICs are more frequently detected in the fallopian tubes of women with hereditary BRCA mutations than in the tubes of women without ovarian or tubal carcinoma. 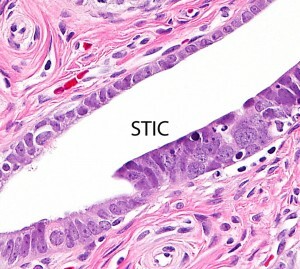 Recently, investigators have demonstrated that STICs express several potential oncogenes frequently found in HGSC, further linking both lesions. 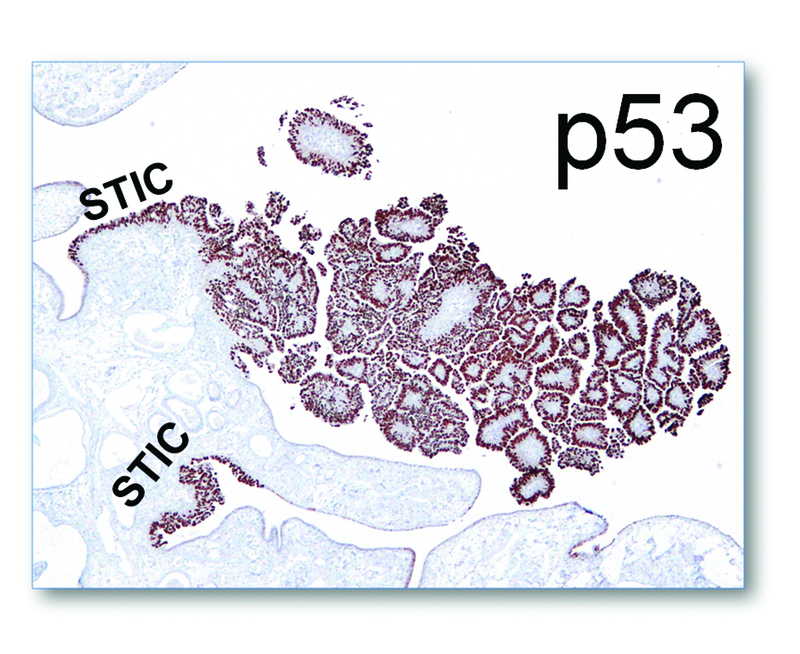 In addition, gene expression profiling has demonstrated that HGSCs from the fallopian tube and ovary are indistinguishable. Finally, the proposal of STICs as putative precursors of HGSC is supported by the fact that both more closely resemble fallopian tube epithelium (FTE) than ovarian surface epithelium, which has been long thought as the cell of origin of “ovarian” high-grade serous carcinoma. 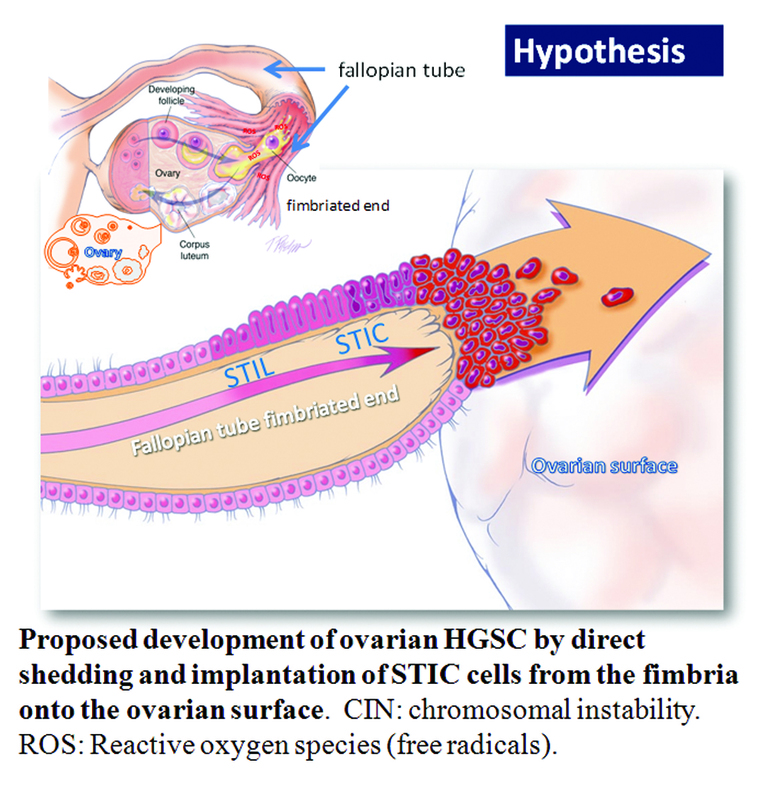 Taken together, both morphological and molecular evidence has suggested the tubal origin of most ovarian HGSCs. 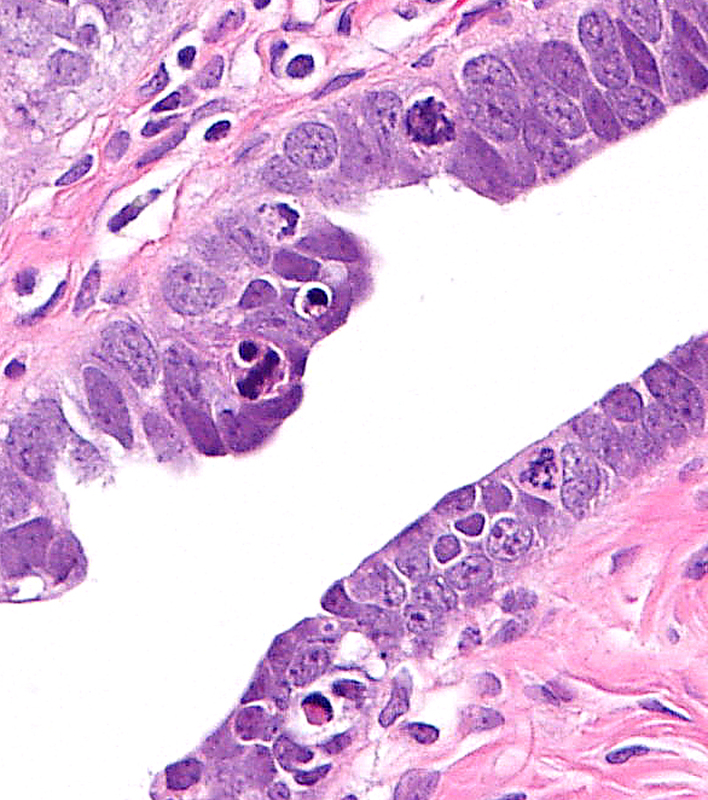 As the fallopian tubes are now being more carefully studied using the SEE-FIM technique, in which all the fallopian tube epithelium including the fimbria is completely evaluated, microscopically additional abnormalities in the FTE have been discovered. 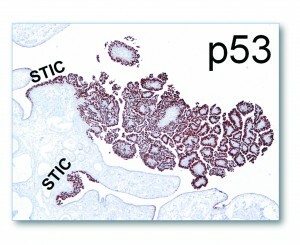 These include cytologic abnormalities that fall short of STICs that we have tentatively designated “serous tubal intraepithelial lesions (STILs), and short stretches of normal appearing FTE that strongly expresses p53 and in which TP53 mutations have occasionally been identified, termed “p53 signatures”. 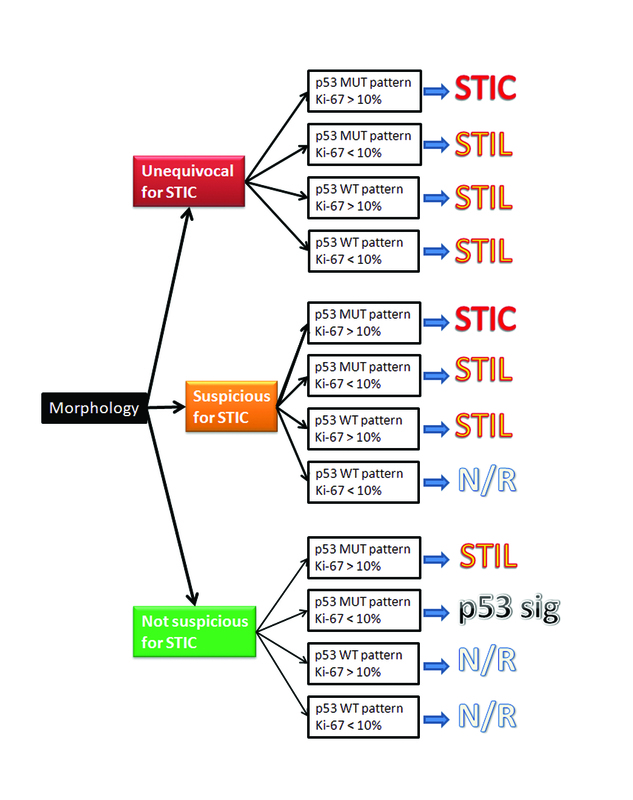 At this time, it is not clear whether STILs and p53 signatures are precursor lesions or represent benign “reactive” type changes that have no biological relevance to neoplasia. Instructions for use of the algorithm. 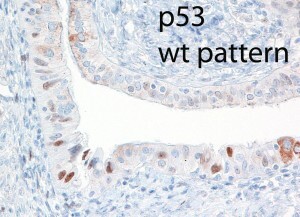 Intraepithelial lesions are first assessed by morphology, followed by immunohistochemistry. 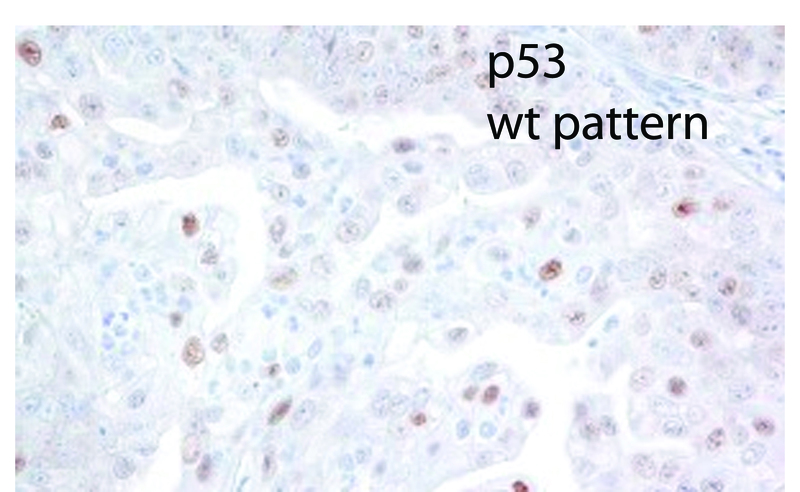 1) nuclear enlargement, 2) hyperchromasia, 3) irregularly distributed chromatin, 4) nucleolar prominence, 5) mitotic activity, 6) apoptosis, 7) loss of polarity, and 8) epithelial tufting. An interpretation of “Suspicious for STIC” is made if many of these abnormalities are present. 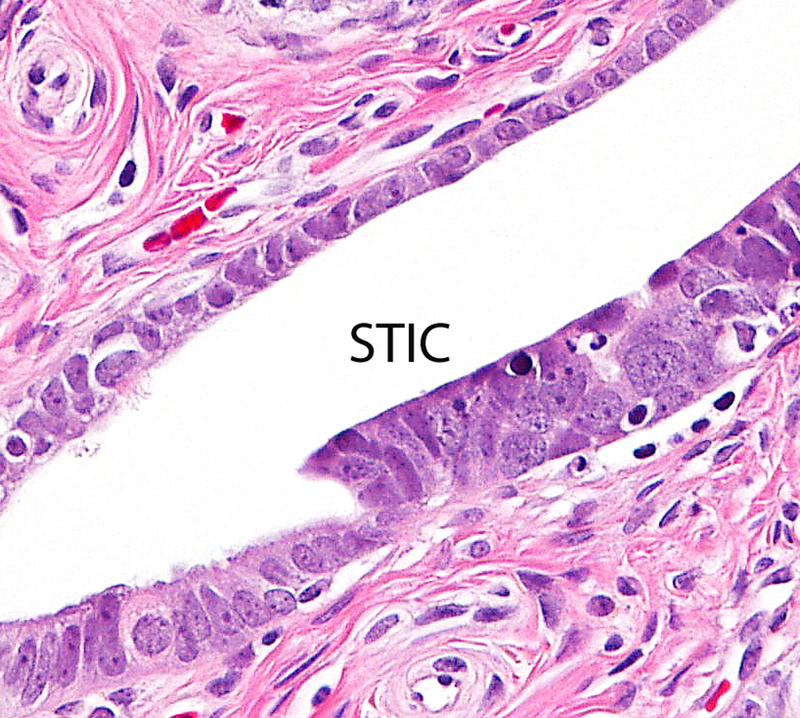 An interpretation of “Not Suspicious for STIC” is made if minor cytologic abnormalities are present that are insufficient to warrant placing the focus of epithelium into either of the above two categories. Two photomicrographs showing some of the above features are illustrated below.